This paper documents the corpus-based investigation of a collection of historical broadsheets from the 18th century with regards to the use of legal terminology and explores the specific language features of the genre in terms of legal terminology with the help of digital methods. 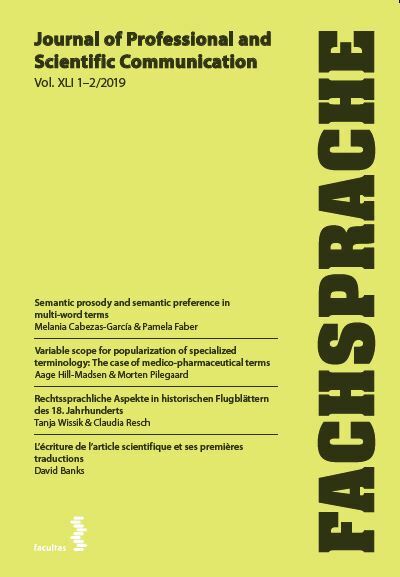 Elements of specialized language cannot only be found in specialized text but also in other text genres, among them media texts. The article aims to contribute to research into historical legal terminology of the 18th century, while simultaneously bringing into focus a little-explored media format, the historical execution broadsheets also known as “Death Sentences”. Wissik, Tanja, und Claudia Resch. 2019. „Rechtssprachliche Aspekte in Historischen Flugblättern Des 18. Jahrhundert“s. Fachsprache 41 (1-2), 41-60. https://doi.org/10.24989/fs.v41i1-2.1501.